Cozy cottage is a perfect blend of horticultural and architectural splendor located in stoneymead, one of the most prestigious neighborhoods in buckingham township, bucks county. This special enclave of 26 custom homes was built by the trueblood company whose name is synonymous with excellence and quality craftsmanship. A gracious foyer welcomes you into this meticulously cared for and beautifully designed home with premium amenities and appointments, including wood floors, beautiful wood moldings and wainscoting. The living room/great room showcases a gas fireplace with antique mahogany mantle and marble surround, custom built in cabinetry, exquisite raised paneling with a satin patina and a craftsman dry bar. Two pairs of sliding doors open to a screened in porch overlooking the pond and landscape gardens with specimen plantings. Nature finds serenity here indeed! The spacious dining room has built in corner cabinets, crown molding, french doors that open to a lighted perennial garden and is perfect for hosting special gatherings. The chefs kitchen has cherry cabinetry, stone counter tops, microwave, large oven, warming drawer, wolf appliances and pantry. Large breakfast room with reflecting sunset views over the pond is a perfect way to end your day. A first-floor bedroom with bath, walk in closet, built in cabinetry is currently used as a den/library. Second floor main bedroom has all the amenities one would require, plus two walk-in closets with dressing area and a sweet raised sitting alcove. French doors open to a private balcony overlooking the pond and its abundant wild life. Two other large bedrooms plus 2 full baths, many closets, built in cabinetry, laundry/hobby room and walk in cedar closet complete the second floor. Lower level features a family room with cabinetry, half bath, walk in closet, plus a separate exercise room and a large lighted basement for storage. Other features include radiant heat throughout, three car garage with expansive storage space above plus another separate garage, and amenities too numerous to mention. 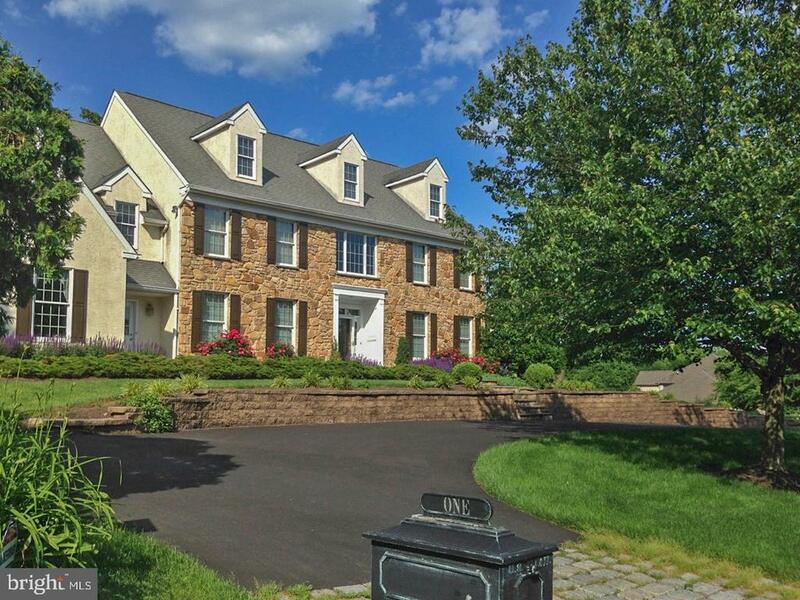 This amazing property offers one of the finest homes in buckingham township. Come experience the true meaning of home, peace and quiet, love and warmth. Custom designed and built with great attention to detail, this majestic residence is located in the mercer gate enclave, an exclusive cul-de-sac with 7 other elegant homes. Your guests will enter from the front circular driveway. Once inside, you immediately feel the sense of welcoming warmth. Continuity is created by the connection of generous spaces filled with glorious window views, natural light, architectural details and quality building materials. The ceilings are 9' and are accentuated by substantial millwork starting with the spacious two story entry foyer. Beautiful inlaid hardwoods and tile flooring run throughout the first floor. Stepping to the left, you will delight in hosting guests in front of the dining room fireplace, relaxing in comfort and ambiance. The kitchen boasts everything a chef could dream of ~ a beautiful island/bar kitchen, maple cabinetry with granite countertops, double viking oven and viking cook top, stainless steel appliances and planning desk. The sunny breakfast room opens to the heated pool where the sounds of the waterfall are heard cascading from the elevated hot tub to the pool below. The kitchen is open to the family room, featuring a floor-to-ceiling stone fireplace with raised hearth, reclaimed barn wood flooring and a wall of doors leading to the pool. Pocket doors separate the butler's pantry which provides a beverage cooler, wet bar and plenty of extra storage and workspace. Step down from the family room into the window wrapped sunroom with 6' high windows, 14 ' ceiling height, with views of the serene rear and side yard landscaping. Continuing on, notice the extra volume ceiling in the study/office which is quietly located on the main level and adjoins the charming game room for family puzzles and card games. The laundry room, mud room, and back staircase are opposite the family room from the kitchen and the updated guest powder room and the entry foyer complete the first floor. The open staircase in the foyer leads to the second floor, where an expansive master suite is found along with four more bedrooms and three full bathrooms. The luxurious master bedroom has a separate sitting room, dressing area, two large walk-in closets, a bath with dual head open walk-in shower with glass block privacy wall, imported italian tile flooring, walls/backsplash and jacuzzi tub enclosure. The third floor is the 6th bedroom with full bath, a large 36' x 13' second master bedroom suite/aupair suite/guest suite. Large enough to be a bedroom/ living room combo and enjoys its own full bath with california shower. The finished lower level is a gem and is perfect for family gatherings ~ both large and small - and is an entertainers dream. The east end features a stone fireplace which adjoins a custom wet bar section, a separate billiard area and powder room. The west end of the lower level houses a reading area with custom built-in~s and ~ last, but not least - a hall leading to the climate controlled, 1600-bottle redwood wine cellar. The grounds feature an irrigation system and are landscaped with specimen trees and special plantings. A garden shed keeps lawn/pool equipment close at hand. There is an upgraded/enhanced 6 zone hvac, central vacuum, and an oversized 3-car garage. 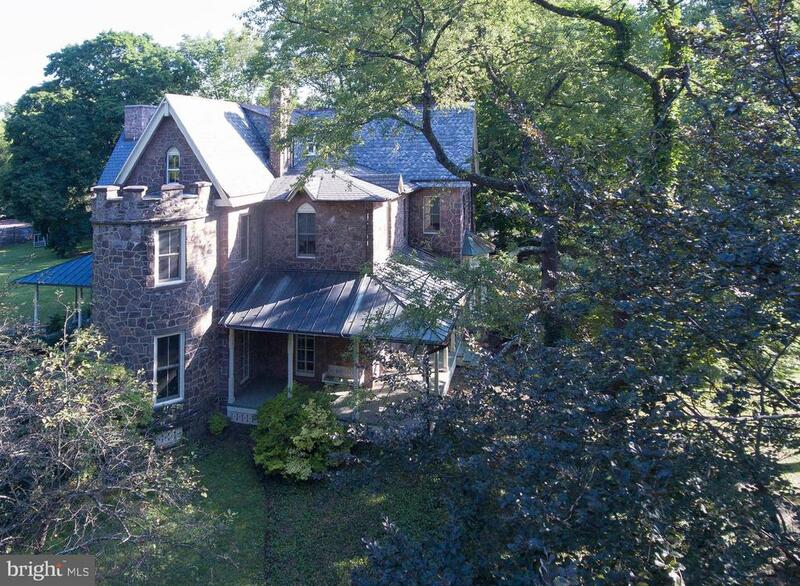 Located in the award-winning central bucks school district, this home is walking distance to downtown historic doylestown borough with museums, galleries, restaurants, shops and theater. 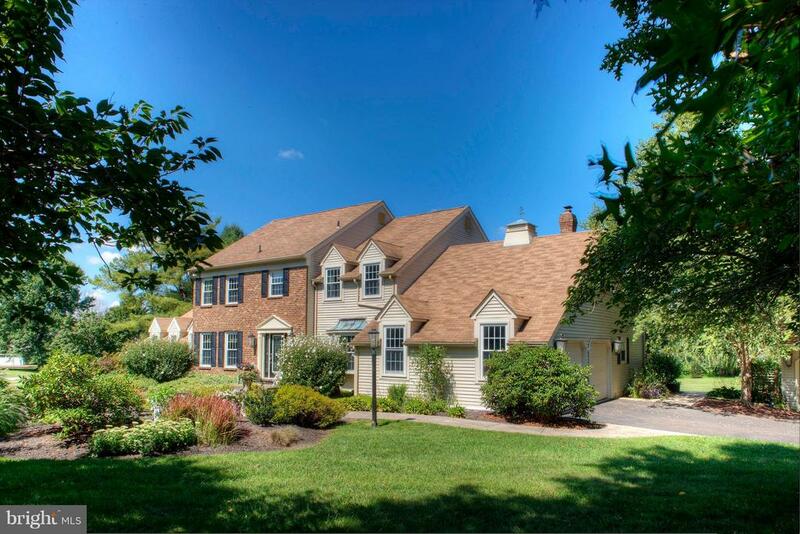 Situated in a bucolic setting in buckingham township this stunning 5 bedroom, 4 full and 2 half bath home is on a cul-de-sac street within the distinguished community of stone ridge. You will immediately be impressed with this custom built executive home that features exceptional indoor and outdoor living spaces complete with an in ground pool/spa, expansive patio, privacy landscaping and fenced yard. The lovely center hall foyer welcomes you with gleaming hardwood flooring, architectural millwork and natural light. Flanking the foyer are the formal living room with marble fireplace and the dining room with a cozy bay window. Adjoining the living room is a spacious study with built in shelving, windows all around and access to the 1st half bath and french doors to the patio. Entering the gourmet kitchen you immediately notice the quality of the warm cherry cabinetry with inset doors, handsome granite counters and stainless steel double sink below a charming window. 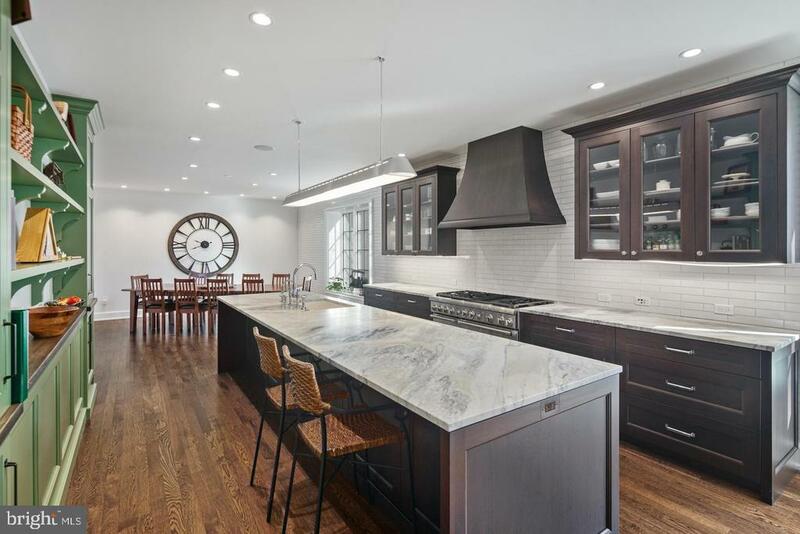 Other highlights include high end ge monogram appliances including a gas cooktop, wine fridge and double wall oven as well as an oversized center island with additional storage, seating and bar sink. The open floor plan flows directly into the breakfast area with french doors to the patio and just a few steps to the dramatic great room with vaulted ceiling, marble front gas fireplace and a wall of windows overlooking the resort style fenced rear yard. The back hall accesses the rear stairs, a large pantry closet, the laundry room, garage access and 2nd half bath. Ascending the front stairs to the 2nd floor, you'll find a spacious landing and wide hallway. Double doors provide entry into a serene owner's suite with tray ceiling detail, french doors to a juliet balcony, comfortable sitting room with oversized palladian window, 2 walk-in closets and lots of natural light. The luxurious owner's bath features a corner whirlpool tub, oversized shower, linen storage, double corner vanity and numerous windows. Bedroom #2 & #3 make up the jack and jill suite which features expansive closets and access to a shared bath. Bedroom #4, the princess suite features a ceiling fan, walk in closet and private bath. Lastly, bedroom #5 has been incorporated into a spectacular 2nd floor in-law/au pair/game/media suite with a full bath. A spacious hall bath and linen storage completes the upper level. An extra height basement is just waiting for your personal design and finishing. A media room, game area or additional bedroom space are but a few possibilities for this expansive space. The amazing 3 car side entry garage has room to spare. 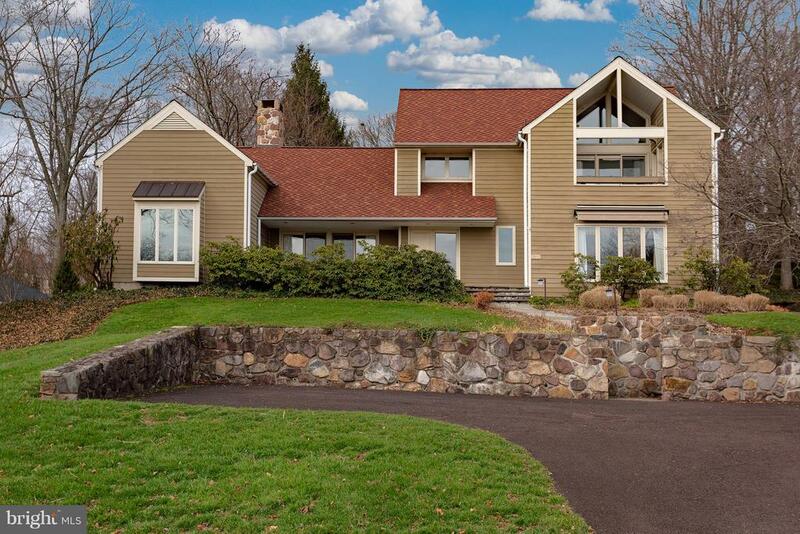 The location of this home makes for an easy commute to new york, new jersey and surrounding counties. Shopping, dining and cultural amenities are just a short distance away in peddler's village, new hope and doylestown. The sellers are offering a 1-year first american home warranty for the new owners! 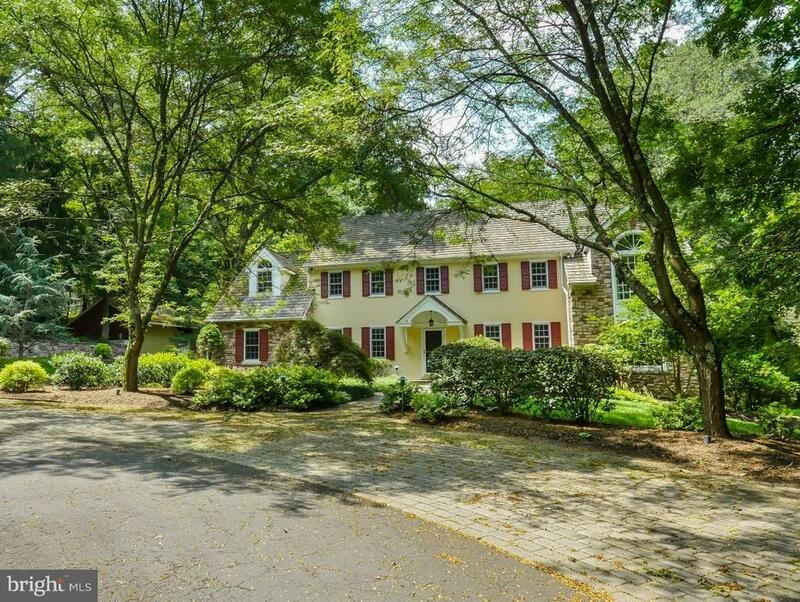 Stunning & comfortable new hope solebury home on 2 acres with a 4 car garage has privacy and location! Low taxes, flexibility with possible first floor master or in-law (shown as office), loads of natural light, hardwood floors throughout first floor, with loads of improvements added over the years. Nothing left to do but move in! An abundance of natural light throughout surrounds you in nature. Large living and dining rooms are accented with moldings, a bay window and flank the oversized inviting foyer. The two-level custom gourmet kitchen is the heartbeat of this home, featuring granite counters, stainless steel appliances, vaulted ceiling with beams, 5 burner gas cooktop with downdraft, double convection ovens, insta-hot, pot/pan drawers, huge double door pantry with built-ins, pull outs for more storage and a fireplace! Open to the breakfast room with panoramic views of the yard, vaulted ceiling, outside entry & solar shades, this room is the ultimate in relaxation! The large inviting family room with fireplace, bay window with views of the expansive two-tier deck and yard, is immensely comfortable. Features include a hidden bar with granite counter, copper sink & faucet, wine cooler and perfect for entertaining inside or out. The oversized office or, 1st floor master/in-law, features large walk-in closet with windows, luxurious custom bath with grohe fixtures, double vanity, oversized shower with dual sprays and a seat & soaking tub. Brick accented gas fireplace and indirect lighting in the tray ceiling gives a warm ambiance, and sliding pella doors to the deck for easy outdoor access. Perfect for long term guests, alternative master and delightful as an office! Upstairs you'll find 4 large bedrooms all freshly painted with new light fixtures, new carpet & awesome views of the front and rear yards. Master bedroom features walk in closet and private sitting/dressing room with vaulted ceiling and gas fireplace, beautifully updated bath with porcelain floors, granite counters with center vanity area, granite shower curb and wall accent, larger shower with seamless glass and seat. There is a huge walk in attic with cedar closet in one bedroom for tons of storage or, create an en-suite! A 4 car garage, in-ground pool re-plastered and re-tiled, 4 zone hvac and an extensive improvement list! 1 mile from peddler~s village, minutes from new hope and doylestown and adjacent to renowned lavender farm, this is a fantastic opportunity! Along a rolling country road, stone pillars mark the entrance to this majestic bucks county manor home. A governor's driveway leads through a buffer of white pines into a clearing that reveals this reproduction farmhouse & surrounding ancillary buildings. Adorned with period details such as exposed support beams, a morgan mantel over the faux fireplace in the dining room, solid wood doors with wrought iron hinges & hardware. Extensive woodworking is found throughout, and is most evident in the built-in cabinetry that consumes an entire wall in the living room. The eat-in kitchen acts as the heart of the home & is adjacent to a morning room with a bank of windows & french doors to a secluded deck - the perfect respite to indulge in the latest mystery while soaking in the peace and serenity of this premium locale. Step through the kitchen and back in time into a reproduction of george washington's room at valley forge. Three sets of stairs lead to the second level where the master suite is a serene escape with its own dressing area, a multitude of closets (some with organizers) and storage areas including a window seat. There is even an office/study with fireplace. The spa-like bathroom consists of radiant heated floors and heated towel rack, a granite vanity with undermount sinks, a soaking tub and walk-in shower with seamless glass. Another bedroom has its own half bath, while a full bathroom and another bedroom complete this level. Up another flight of stairs to the third floor, where two more bedrooms share a full bath. The enormous lower level has two staircases and beautifully finished space for a theatre room and separate exercise room. The cobblestone terrace with lighted pergola offers the opportunity for al fresco dining. Here walls of stone with bluestone capping and stairs guide you to the heated pool and spa - heated separately to provide the option of keeping the spa open year-round. A stone pool house mimics the later additions to the main house and provides a full service cabana with wet bar and seating. Picturesque grounds are both wooded and open with perennial flower beds and bushes throughout. Perfect just the way it is, but if the current layout is not ideal for the needs of its new occupants, this flexible floorplan lends itself to endless possibilities. An in-law suite can easily be envisioned, and there is even a guest house waiting to be finished in part of the two-story carriage house/4-car garage. Enchanting setting, located in the award-winning central bucks school district. Minutes away from the wonderful restaurants, shops, theater and entertainment in the historic towns of doylestown, new hope and lambertville.